The Neave Trio’s previous two releases were with Chandos (review ~ review) so it surprised me when their new recording appeared on the American Azica label. 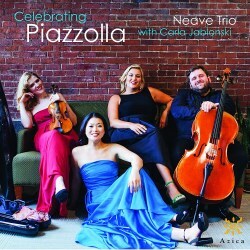 I fell in love with Piazzolla, and his “Four Seasons” particularly through the 2008 Sony recording with cellist Jan Vogler and colleagues (review). Given the mostly very positive reviews of the Neave Trio, this new CD seemed an enticing prospect, even though half the disc was occupied by vocal versions of his music, not something to which I would be otherwise be drawn. Piazzolla’s nuevo tangos, even when arranged for piano trio, are not “classic” classical works, in that one expects a degree of improvisation and freedom, and certainly the performers are totally entitled to express their personalities in ways that one wouldn’t expect with Beethoven, for example. That said, the resulting performances failed to give me any satisfaction at all. Winter contains a most glorious melody, but here its beauty, so overwhelmingly passionate in the Vogler version, is uninvolving, bordering on anonymous. So disappointing. The other five Piazzolla works are songs, arranged by the son of a former violinist with Piazzolla’s quintet, and, as I already mentioned, not my usual listening. American mezzo Carla Jablonski is well-credentialed, and her voice suits these arrangements which often have the feel of a cocktail lounge or jazz club. They certainly didn’t alter my future listening habits. I wasn’t actually aware that Oblivion, one of Piazzolla’s best-known works, was even a song, and this is the only recording among 30 in the Naxos Music Library to include the vocal component. For me, it is the weakest of the five arrangements. The original piece by the songs’ arranger is undistinguished, and compares poorly with those of the master – is it unkind to say that it seems a vanity inclusion? This is the most austere, restrained and frankly non-sensual Piazzolla I’ve heard; its sound world is much more that of the smoke-filled jazz club, and it may be that the audience for this recording is found there. Production values are fine, though you will note the very miserly runtime for a full-priced release. In this instance, I’m “secretly” pleased the full disc capacity wasn’t employed, and I doubt I will surprise anyone when I say this isn’t staying in my collection.